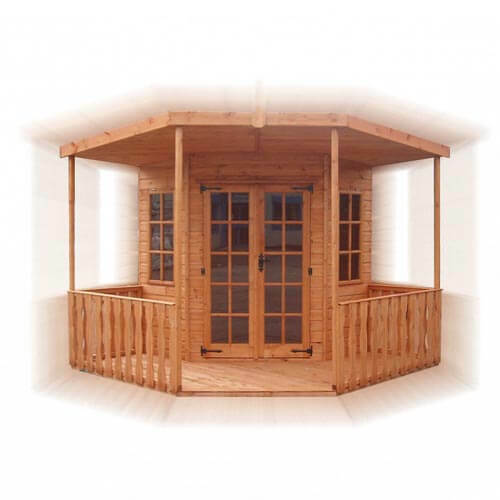 The Blenheim corner summerhouse is perfect for those with a bigger garden, with sizes from 9ft x 9ft to 11ft x 11ft. With windows either side of the door and on the door itself, you can sit back, relax and enjoy your garden throughout the year. Adding a canopy over the 3ft verandah keeps you cool in the shade and protects from the unpredictable British summer. Georgian double doors, antique hinges and an ornate handle complete the classic look, which can complement any garden. The Blenheim corner summerhouse is perfect for enjoying your garden with a fantastic view, both from outside on the verandah or inside during cooler months.